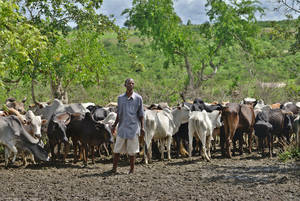 A livestock owner in Kenya with his remaining cattle after drought killed two-thirds of his herd. 14 July 2017, Rome – Poor rains across East Africa have worsened hunger and left crops scorched, pastures dry and thousands of livestock dead – according to an alert released today by the UN Food and Agriculture Organization (FAO). Turning political will on ending hunger into action requires strong focus on national strategies, including to those on nutrition, health and education policies. 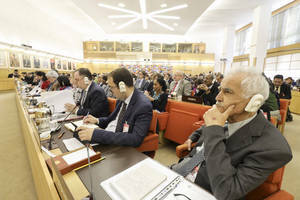 Achieving the international community’s goal of eradicating hunger and malnutrition by 2030 is indeed possible, but this requires a scaling up of action, including greater investments in agriculture and sustainable rural development, FAO Director-General José Graziano da Silva said. Speaking at a side event on Zero Hunger at the FAO Conference, Graziano da Silva pointed to some stark facts and figures. “Today more than 800 million people are still chronically undernourished … and unfortunately the number has started to grow again,” the FAO Director-General said. Around 155 million children under five are stunted – close to a quarter of the total while 1.9 billion people are overweight, of which at least 500 million are obese and 2 billion suffer from micronutrient deficiency, he added. While progress in combating the related scourges of poverty and hunger has been made in recent decades, these achievements are at risk of being reversed as conflict, population growth, climate change and changing dietary patterns, all pose new challenges, Graziano da Silva said. He noted that the world is facing “one of the largest humanitarian crises ever” with more than 20 million people at risk of famine in four countries: North Eastern Nigeria, Somalia, South Sudan and Yemen. He cited the Malabo Declaration adopted by African Union leaders to end hunger in Africa by 2025 and also referred to the strong commitment to food security made by countries in the Asia and Pacific region and in Latin America and the Caribbean. Turning political will into action requires a stronger focus on national strategies, including to those relating to nutrition, health and education policies. The FAO Director-General called for enhancing governance and coordination mechanisms to facilitate dialogue and create incentives for different sectors and stakeholders to work together and to sharpen the focus of Zero Hunger initiatives. “For that, decision-makers need solid and relevant evidence, including statistics and monitoring data,” he added. “And last but not least, we have to significantly increase investments,” Graziano da Silva said. Some of the causes, especially conflicts, are man-made. Famine and starvation are threatening the lives of tens of millions of people in Africa today. In Ethiopia alone, over 7 million people need emergency food aid. What is troubling is the fact that food aid will run out soon in the country. This is extremely unsettling and begs the question: Will this cycle of hunger ever end? Ironically, exactly a decade later, almost one million Ethiopians died in one of the worst famines in recent history. This was not the last one. Famines have been recurring, and they will return, unless public authorities, the donor community, United Nations agencies, regional bodies and national institutions genuinely refocus their efforts on dealing with the underlying causes, some of which I highlight below. 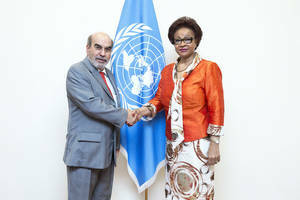 FAO Director-General José Graziano da Silva and Josefa Leonel Correia Sacko, Commissioner for Rural Economy and Agriculture, African Union Commission. The African Union (AU) and FAO will seek to step up joint efforts to end hunger and sustain peace in the continent say FAO Director-General José Graziano da Silva and AU Commissioner for Rural Economy and Agriculture, Josefa Leonel Correia Sacko . In a meeting on Tuesday, Graziano da Silva and Commissioner Sacko underscored conflicts as a common denominator in areas facing food crises in the continent. “Conflict exacerbates hunger and in many cases hunger and food insecurity to intensify strife and social unrest,” the FAO Director-General said. Protracted conflict in particular in northeastern Nigeria, Somalia, South Sudan and in Yemen, which is also a experiencing a hunger crisis, has left 30 million people, mostly children, in the throes of severe food insecurity, with 20 million potentially facing starvation. Commissioner Correia Sacko and the FAO Director-General stressed the need for the AU, FAO, the United Nations Office for the Coordination of Humanitarian Affairs (OCHA), and the World Food Programme (WFP) to work closely together to strengthen the links between sustaining peace, livelihoods and sustainable development. The recent report Quantitative Foresight Modeling to Inform the CGIAR Research Portfolio released by the Global Futures and Strategic Foresight (GFSF) team (part of PIM’s research flagship 1) seeks to help the CGIAR centers and research programs, as well as donors and other decision makers to assess the overall impact and benefits of investing in international and national agricultural research programs. 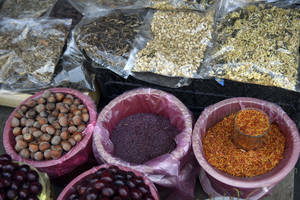 The report provides a quantitative assessment of the impacts of alternative investment options in agricultural research, resource management, and infrastructure on the CGIAR’s System Level Outcomes relating to poverty (SLO1), food and nutrition security (SLO2), and natural resources and ecosystem services (SLO3). Impacts to 2050 are analyzed in the context of changes in population, income, technology, and climate. Other complementary investments will also be needed.